ABSTRACT: Moderately well-preserved Archaeodictyomitrid radiolarian assemblages extracted from the Aptian/Albian transition interval (zones NC7 and NC8 of calcareous nannofossils) of the Sopoti section in southern Albania provide new data for the Radiolarian record during the lower Albian Oceanic Anoxic Event (OAE1b), which was previously unexplored in Tethyan sediments. Two new species (Archaeodictyomitra ioniana n.sp. and Mita amphora n.sp.) 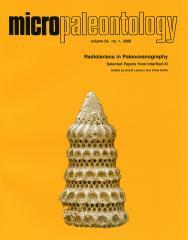 are described and the age range of a number of Archaeodictyomitrid species is specifi ed. The introduction of Mita amphora and M. gracilis at the base of the Albian refl ects a biotic change that is highlighted by a longer/larger overall test size, wide intercostal pores and the development of robust costae throughout the test. These morphological changes are tentatively regarded as the biotic response of Archaeodictyomitrid radiolarian communities within the Ionian Zone to the palaeoceanographic changes that took place during the Aptian/Albian boundary interval.